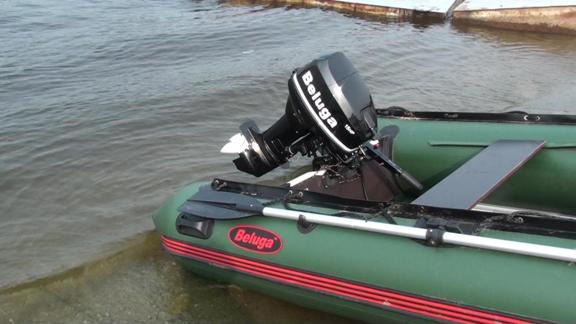 Suspended boat motors BELUGA are made by order of the St. Petersburg Boat Company Beluga. BELUGA are reliable engines that have a modern design and an attractive price. The price of this motor is one and a half to two times lower than the price of a motor of similar capacity of a well-known brand. Boat motor "Beluga" 5 hp, 3.6 kW. Motor "Beluga" has a built-in fuel tank of 2.5 liters, as well as a connector for an external fuel tank. The motor is easily transferred from the lower position to the top and back. It also has six positions when used in shallow water. Before using the motor, do not forget to tie it to the boat, open the fuel supply valve, the air supply valve to the tank and the air damper. If the motor is hot, it is not necessary to open the air damper. Insert a check, add gas and start the engine. Attention! Running in the engine - a very important point, it should not be trusted by anyone! Since this depends on the quality of the engine in the future. Dilute the run-in fuel mixture: unleaded gasoline AI-92 and two-stroke engine oil in a ratio of 20: 1. Let the motor run for 1/3 of gas for an hour, then 1 hour for 2/3 of gas, then 8 hours alternately; full gas - 1-2 minutes, 5-10 minutes 2/3 of the gas under load, i.e. on the transmission. After running for ten hours, replace the oil in the gearbox and use the fuel mixture in the ratio of 1:50. For example, the boat Corsair Combat-335 weighing 65 kg is used, the engine weighs 20 kg, the steering weight is about 80kg, for a total weight of about 165 kg. The speed of the boat with the motor "Beluga" about 30 km per hour. Although no rights are required to use this motor with a boat, you should always wear a life jacket and follow the rules for controlling small boats. Also attach a safety check to your arm or clothing. The speed of the boat together will decrease, and will depend on the weight of the passenger. The passenger should also wear a life jacket, and it will not be superfluous to show him how to operate a boat with a motor, how to start and turn off the engine.